Some news: last week, Nicolas, Thomas and I (Wolfgang) participated in a INET YSI Finance, Law & Economics working group webinar on current account imbalances (within the Eurozone) with Heiner Flassbeck. We had a chance to ask Flassbeck some questions from our perspective – on the type of institution needed to coordinate national macroeconomic policies within the eurozone, for example. From our point of view, Thomas Wieser’s view of of existing european institutions’ current capacity to effectively coordinate the Eurozone member state’s macroeconomic policies is much more realistic than Flassbeck’s view. 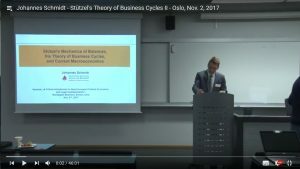 The fourth presentation at our seminar at BI Norwegian Business School is online: Johannes Schmidt presents, for the first time in english, Part II of Stützel’s theory of business cycles. Stützel’s simple general approach solves a number of recurring controversies in monetary economics – especially that of a coherent integration of the “real” and “monetary” or “nominal” spheres – and provides a general theory within which existing business cycle theories – both “monetary” and “nonmonetary” – can be integrated as special cases. 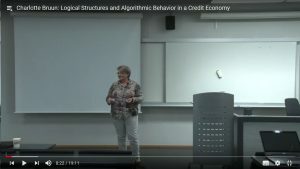 It is based on nothing more than standard business and national double entry accounting categories – plus one original concept (“Lockstep” of inflows/outflows of net financial assets and/or means of payment), which is the core concept of Schmidt’s talk. With the lockstep concept, Stützel demonstrates in a simple way why in models that implicitly presuppose lockstep – such as the Walrasian general equilibrium model or today’s “real business cycle” models – money naturally cannot “matter” (Hahn’s Problem), whereas in Keynesian and post keynesian monetary production models, this is partially remedied as explicitly intended by Keynes, but still lacks the necessary precision and clarity. This precision, however, can be taken simply from empirical (business and national) accounting practice: the distinction between means of payment and net financial assets. Stützel imported this precision into ex ante macro theory as the “bipartite division of the theory of money”, added the lockstep concept and showed (already in 1953) that existing theories can be seen as describing special cases within that general framework. Johannes Schmidt applies this to today’s macroeconomic theories of business cycles. Stützel’s goal was to render superflous the controversy between Keynesians and Anti-Keynesians by demonstrating precisely for which special cases each group is correct and for which special cases each group overgeneralizes. Thomas Weiss’ presentation shows the first part of how he accomplished that. To view the video, click on the image. Read a short summary below. Summary: Ex post, within a closed economy the sum of all increases of net financial assets (positive balances on current account) and the sum of all decreases of net financial assets (negative balances on current account) are always equal by accounting identity, since net financial assets of the world as a whole always equal zero. PLANNED aggregate expenditures (planned decreases of net financial assets) and PLANNED aggregate revenues (planned increases of net financial assets), however, are not necessarily equal since legal persons plan independently from one another on the basis of subjective, uncertain future expectations. If in the aggregate, plans to to increase net financial assets (to achieve positive balances on current account) prevail, aggregate supply (for goods and services) is greater than aggregate demand. This will reduce existing seller’s markets and eventually lead to buyer’s markets, or increase already existing buyer’s market tensions. If in the aggregate, plans to decrease net financial assets (to achieve deficits on current account) prevail, aggregate demand (for goods and services) is greater than aggregate supply. This will reduce existing buyer’s market tensions and eventually lead to seller’s markets, or increase already existing seller’s market tensions. On buyer’s markets, aggregate planned expenditures (“aggregate demand”) will determine which revenues can be realized – in this special situation, Keynesian demand economics holds true. Thus, on existing buyer’s markets, if aggregate plans change from planned increases of net financial assets to planned decreases of net financial assets because the state announces plans to decrease its net financial assets (deficit spending), output and employment will increase. 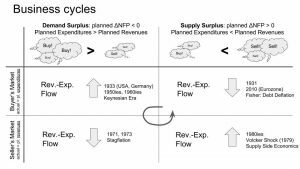 On seller’s markets, however, planned revenues (“aggregate supply”) will determine which expenditures can be realized. This is where Keynesian demand stimulus policy breaks down, and government austerity (as well as a central bank interest rate above the market rate) is needed to boost output & employment. Stagflation during the 1970s may be a historical example for such a special situation, as well as other highly inflationary historical situations (such as today’s Venezuela). The fourth presentation by Prof. Johannes Schmidt, Karlsruhe (coming soon) will present the second part of Stützel’s Theory of business cycles, introducing the concept of lockstep of revenues and expenditures (increases and decreases of net financial assets) and receipts and payments (increases or decreases of the stock of means of payment). Lockstep means inflows and outflows equal each other for a period so there is no change in stocks of net financial assets or means of payment (or both). While this is always true for a closed economy as a whole, for partial groups inflows and outflows will often deviate from each other, lockstep being the exception. Lockstep or deviation effects can happen independently of each other on the level of net financial assets and means of payment, yielding 4 possible combinations. Schmidt shows that current macroeconomic theories each describe one of those 4 special cases. Thus, they are not really theoretical alternatives, but can be integrated as special cases into Stützel’s General Theory. This General Theory is based on standard, precise empirical business and national accounting categories, one original concept (lockstep of inflows and outflows of means of payment and net financial assets), and a few realistic behavioral assumptions taken from everyday business practice. 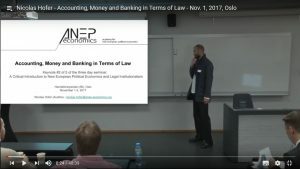 Nicolas clarifies the historically specific legal nature of assets & liabilities, using legal anthropology to distinguish reciprocity based mutual obligations of exchanging favours and gifts within a “Gemeinschaft” (as described in Marcel Mauss’ 1925 classic “The Gift” or in Marshall Sahlins 1972 classic essay “On the Sociology of Primitive Exchange” – for a short intro see here) from money-denominated, state enforceable legal obligations (“financial assets”) within a roman law-based civil society (“Bürgerliche Gesellschaft”). 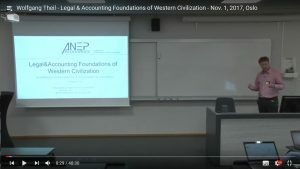 He then introduces a foundational concepts of double entry bookkeeping: the balancing items net worth (equity) – this is what Luca Pacioli originally termed “il cavedale”, i.e., capital and probably the origin of the term “capital” – and net financial assets. 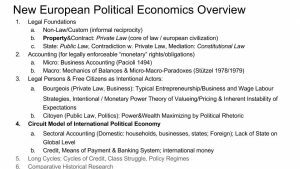 The concept of net financial assets (a balancing item which, for a nation as a whole, is usually called international investment position) forms the core concept of Stützel’s mechanics of balances based ex ante theory of business cycles. It is the core concept allowing for a coherent integration of the real and monetary spheres in macro models. Nicolas then develops this up to sectoral accounting for a closed economy (which is standard in National Accounting and also used in Modern Monetary Theory and Stock Flow Consistent Modelling), clarifying that capitalism is a zero sum game on the level of net financial assets – but not on the level of net worth (profits&losses). For example, it is impossible that all nations achieve positive (or negative) balances of trade/on current account within the same period – one nations surplus on current account will equal the rest of the world’s current account deficit by accounting identity. But it IS possible that all nations increase (or decrease) their net worth within the same period. The next two videos – Presentations by Thomas Weiss and Prof. Johannes Schmidt – will present an introduction to Stützel’s theory of business cycles. Stay tuned, these will be published soon. For a summary of contents of video and the complete seminar, click here. Information on the seminar, including the programme, can be found here. Some short introductory presentations of our approach can be found on our youtube channel. 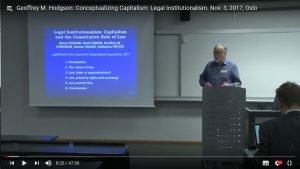 Anyone interested in taking a more detailed look at our approach of constructing a realistic, non-universalist paradigm for analyzing capitalism by reconnecting accounting to the historically specific foundations in roman law it is empirically based upon, and then contrasting this with informal, traditional social relations in stateless contexts, can download some further material below. 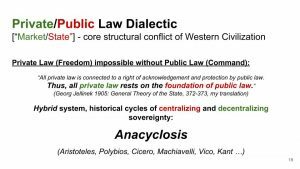 Our own papers are marked by showing the author in bold print, but are augmented by papers detailing the most fundamental building blocks of our conceptual framework: Law, Legal Institutionalism, Mechanics of Balances, and Legal/Economic Anthropology. All links will open in a new tab. Verdery 1996, What was Socialism, What comes Next? Stiglitz 2008, Is there a Post-Washington Consensus? Stützel 1952, Preis, Wert und Macht. Analytische Theorie des Verhältnisses der Wirtschaft zum Staat. Mehrling 2001, What is Monetary Economics About? 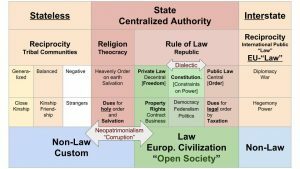 On top of Legal Institutionalism, Micro-Macro Accounting and Stützel’s Mechanics of Balances are the second fundamental building block of our approach, as outlined in Thomas Weiss’ presentations at the 2016 YSI Plenary in Budapest (view here) and 2017 WINIR Conference, “Institutions and Open Societies” (view here). 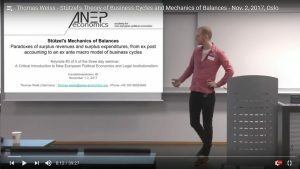 Fabian Lindner is now hosting a new blog in english on Stützel’s Mechanics of Balances. You are invited to explore it here. More detailed overviews in english on the basic concepts of this fundamental building block of our approach can be found here and here.